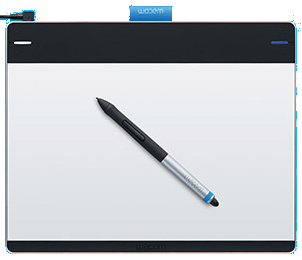 I recently purchased a Wacom Intuos tablet to connect to my computer as a tool to allow real-time annotation on slides during a presentation. These presentations could be recorded or live in nature. Using the mouse or touchpad was too limiting and magnified my already poor penmanship. Once I had the tablet hooked up it was easy to annotate using PowerPoint’s own menus for selecting the mode (pen, highlighter) and colors. 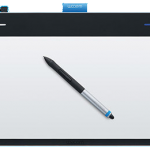 However, the navigation to access those features required traversing through an on-screen menu each time the pen was being selected or whenever I wanted to change the pen color. This was a real nuisance and meant that there would be an on-screen distraction and presentation delay whenever I had to navigate through the menu. I hunted around for an alternative one-click shortcut approach and could not find one. Maybe I missed it but I finally decided to see if I could use PowerPoint macros and active shapes to give me a simple way to select pens and colors. I did get it to function and it works well for my purposes. I’ve documented and demonstrated what I did in a short video. I’m sharing it in case others are looking for an option to do something similar. Once you get the framework in place, it provides the flexibility to use macros for more than just pen color control, but I’ll leave that to the reader’s and viewer’s imagination. I’d enjoy hearing if you have alternative ways to accomplish this or find interesting ways to apply the technique to other presentation features. Happy presenting!